It’s well known that social content has been proven to increase traffic, engagement, and sales – especially during the holidays. This free download will help ensure that you brand is setup for social success this holiday season and well into 2014. In this step-by-step guide, you’ll learn how to win big by engaging consumers across channels and at every point along the purchase path. Whether you’re currently a Bazaarvoice client or exploring ways to more effectively integrate user-generated content into your marketing mix, we’ll outline some of the most critical things to be doing with social immediately and in coming months. 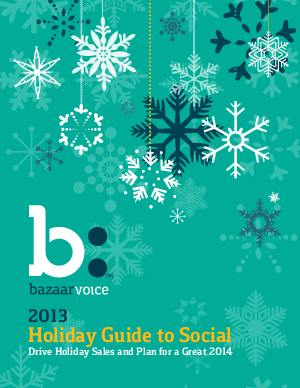 Are you optimized for social success this holiday season?